I bought a used road bike for a great price, it came with a shimano 105 groupset, but the brake it's a Campagnolo centaur. It's a wonderful brake, but every time when I need to remove the wheel it's need to tighten the barrel adjuster to open the brake. I am aware that the campagnolo rim breake release system it's a button in levers, but I would like to know if it is possible to place a release lever directly on the brake, just like the system on the shimano brakes. 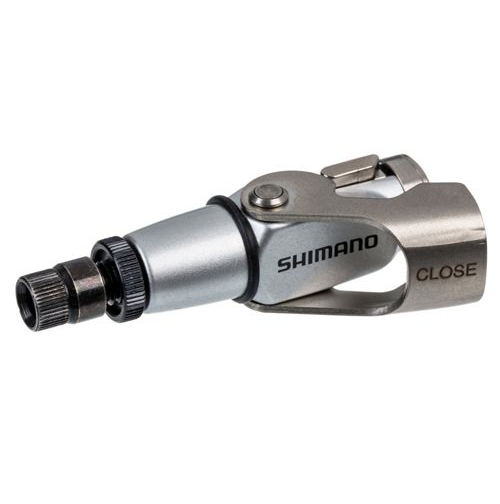 Closest thing out there is the Shimano SM-CB90 in-line brake QR, which exists to be paired with direct mount road calipers but would solve this problem too. I've never heard of such a thing. If such a gadget did exist, it would probably cost more than Shimano 105 brakes. The closest thing I can think of is a cable splitter, intended to be used on some travel bikes: a splitter is two pieces that screw together. Using one wouldn't be less trouble than what you're doing now. Not the answer you're looking for? Browse other questions tagged road-bike rim-brake campagnolo or ask your own question. Beside drive train, what is the difference between group components (e.g. 105 vs. Ultegra)? What size is the tiny ball bearing used in SRAM brake caliper quick release detents? Shimano XT with Campag Centaur crank? Are all side-pull road bicycle brakes compatible? Converting road hydraulic disc brakes to flat bar : Possible?